What Aircraft Tools Do You Need for Your Kitplane? Do You Need for Your Kitplane? As I've been building my airplane, several aircraft tools have proven invaluable. Here's my take on the most critical of those tools. Buy a pneumatic hand squeezer. I bought a used one. There are so many rivets in my kit that this is an aircraft tool that has paid for itself 100 times over. And as a bonus, I can set up the pneumatic to do the big line of rivets, then when something strange comes up I can set up my hand squeezer for the one rivet without messing up the setup on the pneumatic. While you are at it, get the adjustable set holder. You can adjust the depth of the holder by twisting, letting you quickly set the squeezer to fit the rivet you are working on. You no longer need to use a stack of spacers. Do you want to see what other readers have said about tools, or to offer your own story about your Best Kit Plane Tool, or just to ask questions about tools? If so, click here. Otherewise, keep reading about the tools I found most invaluable. You'll get to the reader discussion on tools at the end. Buy a tray with multiple compartments to put all the hardware from the bags into. I tried keeping everything in the original bags, and this ended up wasting a lot of time as I would hunt for one nut or bolt. 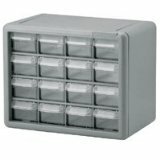 So I bought a storage tray like this Akro-Mils Gray 16 Drawer Plastic Cabinet (left). It was too small, not enough drawers. I ended up filling the whole thing with just rivets, so I bought a second one. You'll need either two of this size, or one larger one like this Modular Small Parts Storage Cabinet (below), whichever works best for you and your workspace. If I was starting over, I would just buy one of the large ones. I put each size/type of nut and bolt in a separate tray. That way, the 2 AN3-4 bolts from one bag and the 4 AN3-4 bolts from another bag would all go in the same tray. 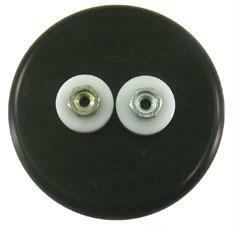 Put each type of rivet in it’s own tray, and have these trays removable so you can bring it to the work. Climbing in and out to get another rivet gets old. One addition to your kit of aircraft tools should be an extra tip for your soldering iron . Round the edges so there are no sharp corners. Use this tip to remove the protective coating on the skins before you do the chemical work and rivet. The hot iron will melt a little line in the plastic, and it will peel off real neat, not all messy like mine. Tips are cheap enough to have one for just the plastic and another for the electrical work. These are very useful. Eventually, you will have to drill a hole through some pieces that are riveted or bolted together. You won’t be able to pull them apart to get to the small aluminum chips left in-between. That’s where the chip chaser comes in. Because it is so thin, you can slide it between the parts past the chips. Then, using the hook at the end, pull the chips out. As an added bonus, they are great for getting the washer into the thin area between parts, like on the hinge pins for the ailerons. If you're building an aluminum skinned airplane, a chip chaser is an invaluable addition to your aircraft tools kit. You can manage to build the entire airplane without these in your bag of aircraft tools, but it’s a lot harder. These make drilling the attachment holes for platenuts quick and easy. After you have drilled the main hole that the screw will go through, you insert the large pin of the jig into it. Then drill the first rivet hole. Flip the jig over, insert the main and rivet pegs into the two holes you now have, and drill the second rivet hole. This gives you an exact fit every time. You will need one jig for each size platenut. I tried one of the fancy one handed strippers that are supposed to pull the coating off the wire. 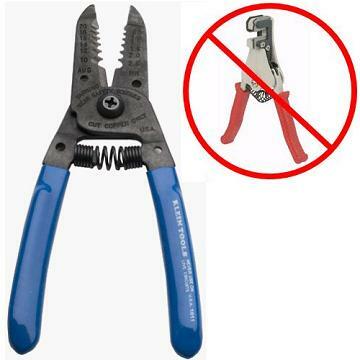 I found that on the small wires I was dealing with, it kept pulling strands of wire with it, so I gave up on it and went back to my trusty older set like this Klein 1011 Wire Stripper Cutter. This is one of my most well used aircraft tools. The Paladin 2031 22-8 AWG Non-Insulated Terminal Die Set , which fits in the Ideal crimp tool (for large wires such as main power). I have tried both the round tool and the tool that looks like a small pair of vice grips, and have had better luck with the later. The two rollers are shaped to give you the proper bend at the proper space from the edge of the skin. They are adjustable to the thickness of the skin being worked. Although you can use a break for the few straight skin edges, this tool is a lot cheaper, and works for all the edges. It only took a few test pulls to figure it out. At first I had the tool set too tight, and it wouldn’t roll. This isn’t necessary, as the shape of the rollers does all the work. The only other thing to pay attention to is that the tool doesn’t roll off the edge as you work your way along. There is a lip on the rollers. Just keep that lip up against the edge of the skin and it works great. 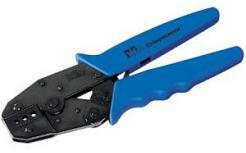 Add the edge roller that looks like a vice grips to your aircraft tools. These make quick work of the interior holes in the skins. They use the same dimple dies as the hand held dimplers. I have seen pictures of benches with a cutout to recess the tool, making the top of the bottom dimple die flush with the top of the bench. This keeps the skin flat when dimpling, and prevents little smiley faces. I found that the top of the dimple die sat the same height as a 2x4 with a piece of padding taped to it. So I just set the tool on the bench, and put a 2x4 on either side to keep the skin flat. You will also need a tube bender in your aircraft tools so you can bend the various aluminum tubing of your kitplane. I have used several of both of these first two types of tube benders, and prefer the one on the left with two handles. I have seen some of the cheaper benders of both types where the grooves in the two halves of the tool don’t line up, leaving a gouge or dent in the bent tube. When you buy your tool, make sure the halves match. 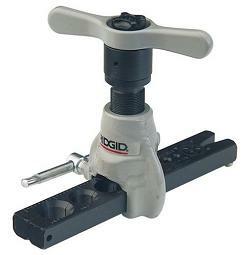 I recommend this two-handled type Pro-Grade Hand Tube & Pipe Bender. I don't recommend this type of one-handled tube bender. I have never tried this kind of tube bender, so I can't recommend or not recommend. This is a set of springs. You insert tubes of different diameters into the matching diameter spring, and then you bend the tube that is inside the spring. The spring keeps the tube from kinking while you bend it. 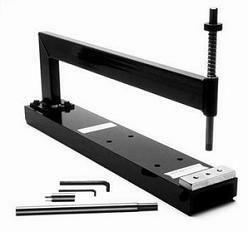 If you've had any experience with this type of tube bender, please contact me and let me know. Once I've received a definitive amount of feedback one way or another I'll post some results here. This is one of those aircraft tools that is a good candidate for sharing. 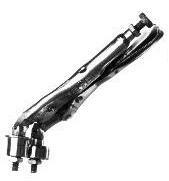 You will only be using this tool to flare your fuel and brake lines and possibly your pitot/static lines. Then you will not need it again. (See how I did mine here) It isn’t cheap either. Don’t be fooled by the ones you can get at Autozone, they are the wrong angle. Automotive tubes are flared to 45° not the 37° used for aircraft fittings. Ask around at the airport before you buy this one. Someone in the local EAA chapter may already own one, and will probably lend it to you. If your EAA chapter, or your builder's group is ready to get a tube flaring tool, I recommend this one, the Ridgid 41162 3/16" - 3/4" ratchet flaring tool no. 377. It looks different than the type you've seen me use in the pictures. My EAA Chapter didn't have one like this. But, I've checked this one out. It's 37°, really nice. Tell us about your favorite tool -- that special tool you found invaluable. Where did you get it? How did it solve a special problem, or save you time and effort? Did you make a special tool? Or, if you want to ask a question about Kit Plane Tools not already addressed here, please do so. I will respond to all entries. Entering your Best Kit Plane Tool story is easy to do. Just type! Do you have a picture of Your Best Kit Plane Tool? Great! Click the button and find it on your computer. Then select it. Maximum size is 800x600 pixels.